After housing, a vehicle is the most costly item in a European family’s budget. When realising that the repair and maintenance of vehicle accounts for almost the same amount as its purchase, one easily acknowledges the importance of keeping replacement parts, repair, and maintenance affordable. The repair and maintenance of a vehicle involves a complex chain of various actors, the so-called ‘automotive aftermarket’. Each stage within this aftermarket chain has its importance, each operator fulfilling a special role to keep replacement parts, repair and maintenance competitive and efficient. A truly competitive automotive aftermarket is the prerequisite to keep mobility affordable throughout the entire life of a vehicle. How does the repair chain work? When building a vehicle, manufacturers rely very much on parts suppliers, also called ‘Original Equipment Suppliers’ (OES). These original equipment suppliers are not only the most important production source of automobile components, they are also the design engineers of most components of the first equipment of new vehicles. On the aftermarket, it is not much known to a broad public to what low extent vehicle manufacturers contribute to the production of automotive replacement parts. Vehicle manufacturers produce only about 20% of the components themselves for repair purposes, whereas the rest of the replacement parts is produced by parts manufacturers, i.e. first equipment suppliers and independent parts producers who supply exclusively the independent aftermarket. 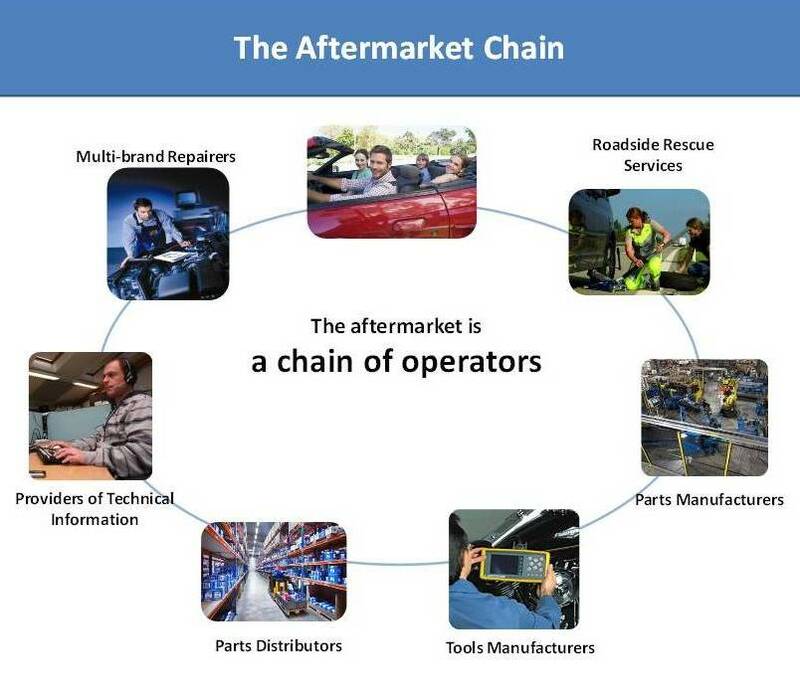 The existence of this independent parts manufacturing industry is important because it produces a wide range of components needed to satisfy consumers’ demand and to ensure competition in the automotive aftermarket between vehicle manufacturers’ authorised network and the independent distribution and repair system. After they are produced, replacement parts need to be distributed to the workshops to perform repair and maintenance jobs. Distributing parts is a specific job that demands experts in product assortment and logistics. Independent parts wholesalers provide an efficient delivery of replacement parts throughout a European supply network. The aim is to get “the right part – for the right price – at the right time” to the workshop: Just-in-time delivery is crucial, as the client want to have his vehicle quickly repaired and back on the road. On the one hand, vehicle manufacturers supply their dealers and authorised repairers of their distribution network the full range of spare parts for all vehicle types of their brand, but for their brand only. On the other hand, independent wholesalers distribute an extended variety of replacement parts of different types and of all brands, ranging from original spare parts and parts of matching quality to parts of higher quality or parts adapted to the age of the vehicle. In all cases, all parts must meet the construction safety and environmental quality requirements. Independent distributors count among their clients above all commercial end users, such as multi-brand repairers, roadside patrols, fleet owners or other retail companies (such as auto centres or supermarket chains). Specialised repairers and gas stations appear as well as common commercial end users, but also authorised repairers of vehicle manufacturers’ networks purchase parts from the independent parts distributors in the same way. When performing a repair or maintenance job at hand, workshops need to source replacement parts. They have the choice between the authorised network and the independent parts distribution. If competition in the upstream market functions efficiently, they can take great advantage of replacement parts prices submitted to competition (there is an exception however concerning so-called ‘captive parts’, parts produced by vehicle manufacturers and that can be sourced only from the vehicle manufacturer’s authorised network). At the very end of the chain, the motorist consumer or commercial user (whether a household owning a car or a company that owns a fleet of commercial vehicles) chooses between the two competing options: authorised repairers affiliated to vehicle manufacturers’ networks, or the independent motor vehicle service market. European motorist consumers should be able to freely choose how, where, by whom and with which parts they have their vehicle serviced or repaired. The wide and varied product range offered by different workshops ensures a healthy competition which will meet the diverse demands of the motorist consumers and help keeping commercial and personal mobility in Europe affordable. The role of the European legislator in upholding effective competition and consumer choice is crucial.